The critical role of the markets and the private sector for Disaster Risk Reduction (DRR) and resilience building has been widely recognized during implementation of the first Hyogo Framework for Action (HFA) (2005-2015), and has been carried forward into the Sendai Framework for DRR (2015-2030). The vast majority of investment in developing countries - 70 to 85% (UNISDR 2013) - comes from the private sector. Private sector investment is shaped by opportunities in markets at domestic, regional and global levels. Today, most communities are dependent on markets for the provision of their food, utilities, agricultural inputs and shelter, and for the sale of their products and employment. 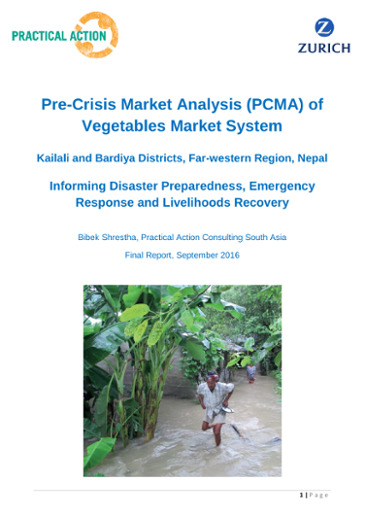 Markets contribute significantly to the livelihoods of the most vulnerable, and their failure when a disaster occurs can have critical consequences. Although markets engage with poor and vulnerable people at the local level, we must not forget that most markets are connected in one way or another to national and global market systems that influence their behaviour. Therefore we need to look at the role of markets at all levels to identify how they can contribute to building the resilience of the poorest and most vulnerable. Practical Action is actively exploring the incentives and mechanisms that create the right conditions for investment decisions that build resilience and reduce disaster and climate risk. We can help the private sector in a number of ways. We can help them be more accountable for disaster risk reduction and resilience building, so that when disasters occur - affecting their investments - the most vulnerable are not disproportionately affected. We can also help them to benefit from a more resilient supply chain. It is vital to understand the potential of markets to exacerbate and/or reduce different risks, because investment in local markets has far-reaching impacts on risk accumulation and underlying risk drivers. 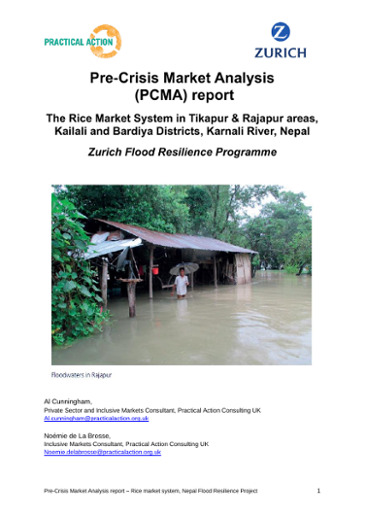 We call this approach Markets For DRR (M4DRR). The goal of M4DRR is to reduce and ultimately avoid the shocks and losses experienced when disasters affect markets, through increasing the resilience of society. This can only be achieved when all the actors, including the private sector and the markets in which they operate, are themselves resilient.